Update: Congrats to Bhamra! The SlimKicker team loved the idea of getting off a stop early on your commute as a way to stay healthy and get more exercise. Okay, guys, we’re going to try something I haven’t done before and see how it works. I definitely want to hear your thoughts on if you like this, if you find it helpful, that kind of thing. I recently spoke with the folks at SlimKicker, an app created to make healthy living (diet, exercise, mental, etc.) fun, accountable, and easier to manage. They’re trying to get the word out about the app and get people to try it, as well as get ideas on new content and challenges. 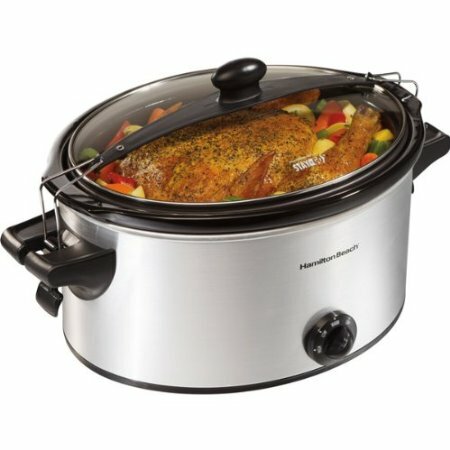 No, I’m not getting paid to talk about it, but they have kindly offered a great giveaway to the winner—a beautiful slow cooker. You can see it in all its glory here. It holds 6 quarts, lid clasps that keep it from spilling (raise your hand if you’ve dumped an entire crockpot of chili in your backseat…), and three different cooking settings. I am jealous of this, since my crockpot is ancient and small and I’m not eligible to win. Basically, SlimKicker is a diet and fitness tracker that takes your diet/fitness goals and turns them into a level-up game. You upload a picture of something you’ll reward yourself with (such as a new handbag), and when you reach a certain number of points, they’ll remind you to reward yourself with that. SlimKicker also has diet/fitness-related coupons such as codes for the diet program Medifast. The app is free to download (or you can use the website), and the set-up process was super easy, took about 30 seconds. It asks a few basic questions about your current weight, weight goal, health goals, and how active you currently are. You can log your food and it’ll tell you where you are in terms of daily calories, carbs, sugars (yikes! ), fiber, etc. It also allows you to add friends who you can compete against or help motivate, and enroll yourself in different challenges. For my first challenge, I picked the “Restore Sanity Challenge”, because my life has been out-of-control crazy lately—the challenge is to set aside 30 minutes per day to do a leisure activity to restore sanity. You, my lovely readers, just leave a comment (1-2 sentences) below telling us your idea for a simple fitness/health challenge—things like “doing 20 pushups a day for 1 week”, “squatting during TV commercials”, or “eat a salad every day”. After 1 week (11:59 p.m. EST next Monday, April 8th), the folks at Slimkicker will pick their favorite and use it on their site and app. Once they choose the winner, I’ll just need have to get their email address and SlimKicker will ship the product (unfortunately for shipping costs, this one is USA residents only!). No signing up for an email list or giving away personal info, it’s literally as simple as leaving a comment below. I’ll get us started. My challenge/goal (in addition to the “30 minutes of sanity” above) is to turn off all screens (TV, phone, etc.) half an hour before I go to bed. I’ve found it makes a significant difference in the quality of my sleep, yet I never actually do it consistently—I’m addicted to my phone! What about you? Can’t wait to hear all your ideas! Take my dog for a 30+ min walk per day after dinner. This will be in addition to my training and it will be a good way to aid digestion and boost recorvery (plus my pup will love me!). My husband and I decided to start working out together. We find that when we encourage each other every day to go for a jog, ride the bikes, or go for a walk we’re much more motivated. And we get to spend more time together! My dear friend and fellow co-worker Tara Shaeffer and I both have jobs where we sit long hours (and you can imagine where the “spreading” occurs). So, we’ve begun a ridiculous manner of moving around our offices when going for coffee, supplies, whatever. Instead of mincing over to the water cooler, we take huge, deep lunges (of course squeezing on the way up). It’s good for our behinds and it’s good for friends to laugh together. My idea is to get off your stop earlier if you’re commuting. If you’re taking the car, park a bit further than normal and walk more! It all adds up, especially if u have a desk job and are inactive during the day – every little bit matters. I hear you–even just getting up and walking over to talk to a colleague instead of sending an email has helped me! Congrats, Bhamra–the SlimKicker folks chose your entry! Send an email to team@slimkicker.com letting them know you won the contest on “findingtimeforcooking” with your email address and they’ll take it from there! Thanks!